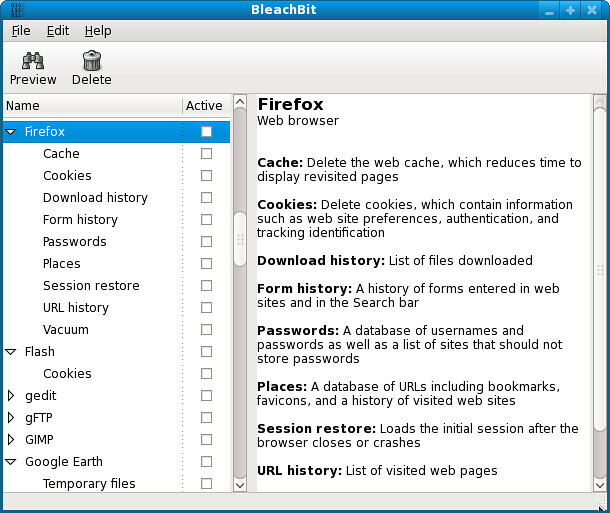 BleachBit is a free and open source utility which will help you get rid of those files which clutter up your hard drive and threaten your privacy. It also includes advanced features to shred files and clean disk space to prevent file recovery. BleachBit, the open source system cleaner, announces the public 0.9.2 beta which includes enhancements, bug fixes, and translation updates. Help in test. Clean ACDSee in Winapp2.ini. Verify the HKU registry key is cleaned. Clean Google Chrome 17 and Chromium 17 history, and verify cleaned URLs are not in the omnibox. For more info see this page. for Other Distro's see this page.